Best-Selling Female Rock Artist of the 20th Century! Madonna by Sebastian Krüger, acrylic on board measuring 40 X 50 cm (16 X 20 in). Madonna Louise Ciccone (born August 16, 1958) is an American singer, songwriter, actress and businesswoman. She achieved popularity by breaching the boundaries of lyrical content in mainstream popular music and imagery in her music videos. Madonna is often referred to as the "Queen of Pop". and is cited as an influence by numerous other artists around the globe. Madonna wrote and produced most of her own songs, with quite a few of them reaching number one on the record charts. Madonna also won the Golden Globe award for Best Actress for her role as Evita in 1996. Having sold more than 300 million records worldwide, Madonna is recognized as the best-selling female recording artist of all time by Guinness World Records. The Recording Industry Association of America (RICA) listed her as the best-selling female rock artist of the 20th century and the second best-selling female artist in the United States, with 64.5 million certified sold albums. According to Billboard , Madonna is the top touring female artist of all time, grossing over a billion dollars from her concerts. Madonna was inducted into the Rock and Roll Hall of Fame in her first year of eligibility. 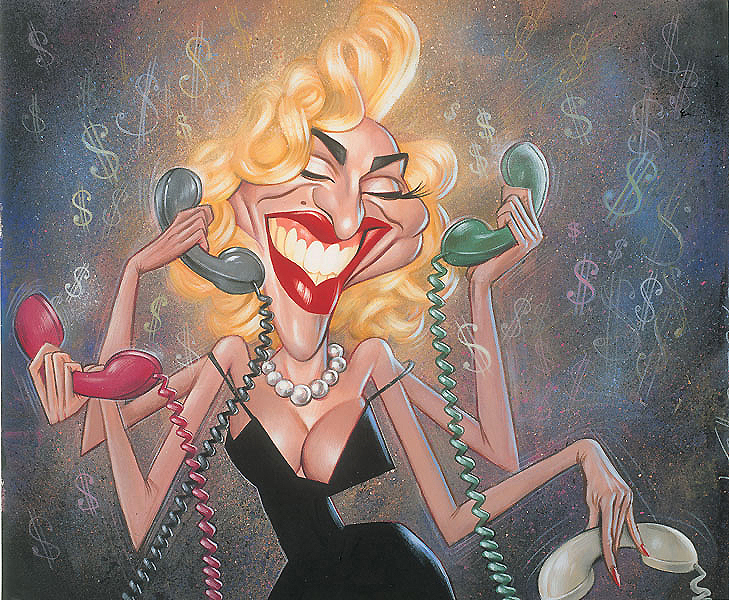 A Fantastic Caricature Painting of Madonna!